Are you ready to celebrate Groundhog Day? If not, you might want to get some groundhog day treats such as these groundhog day cookies and cupcakes ready. Punxsutawney Phil has seen his shadow 100 times since the Pennsylvania town began the tradition began back in 1886. That equates to 600 extra weeks of winter – here’s hoping for those in the bitter cold that he won’t see it this year. To get into the spirit in your town here a few cute groundhog day treats to help celebrate the news. These easy refrigerator cookies make extremely tasty dirt, and no baking is involved. You just have to work quickly and place a teddy graham (ok, imagination please) into the center before you place the groundhog cookies into the fridge to set. You’ve probably seen this recipe before (it’s been around awhile, I think I got it from a friend of my grandmas) but I’ll list it here anyways because it’s a whole new creature when there’s a “groundhog” popping out of the center. 2) Stir occasionally until it begins to boil. 3) Boil for 1 minute, stirring. 4) Add 3 Cups of Oatmeal (Quick or 1 minute Oats) and stir until combined. Be sure to use Quick as your oatmeal type, since these cookies are not baked. 5) Use a cookie scoop (or spoon) and place on a wax paper lined tray. 6) Place a Teddy Graham in the middle of each cookie, pressing some down further than others. I also took advantage of some teddies that were stuck together – they saw their shadow! *Note: Be sure to work quickly, as these cookies will firm up as they cool. 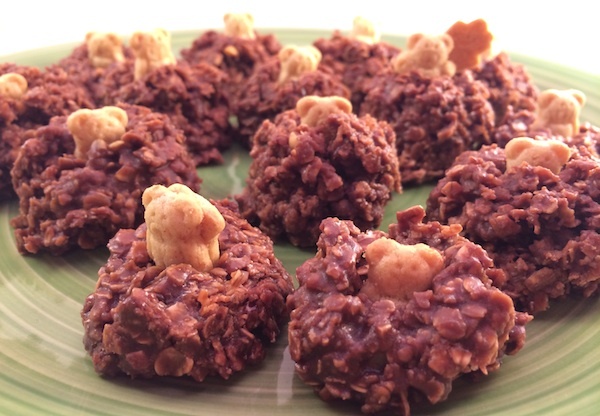 Storage: Store these groundhog day cookies in the fridge, they will keep at least a week. To make these Groundhog Day Cupcakes, start by making your favorite chocolate cupcake. I made chocolate cupcakes without the baking soda so that they fell flat in the middle, but you could also close the oven door on them just after rising, take a little scoop from the center after baking, or just make and frost them as usual. Any look on the cupcake will work. Then I filled the center with a thick chocolate buttercream so it would look like fresh dirt. I added extra confectioners sugar to my frosting to make it thick, but you could frost as usual since these cupcakes are really just about Phil (the groundhog cookie inserted into the cupcake). To make Phil start with Pefferidge Farm Milano Cookies and place them flat on a tray. Easiest for decorating is to have a Wilton (or other brand) ready-made frosting tube or cake decorating tube in the brown color. If you don’t have one, you can put some frosting into a baggie and then cut a small tip off the corner. The frosting will act as your glue. 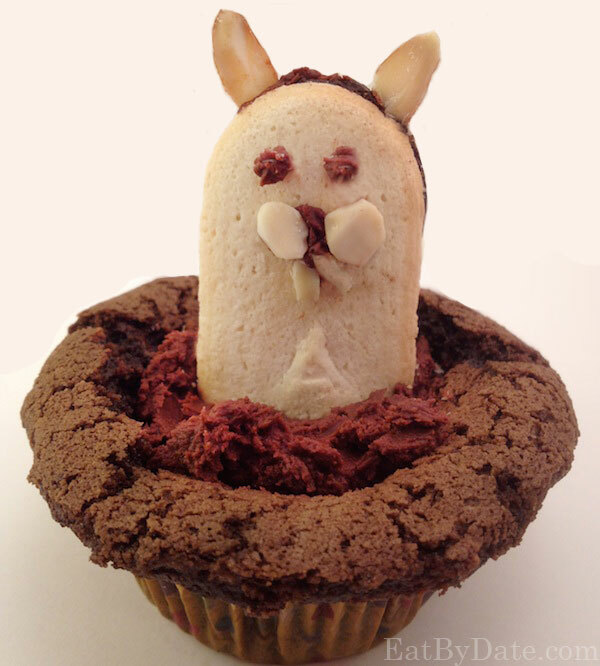 Fix up the cookie by adding sliced blanched almonds as the ears and teeth of your groundhog. The cheeks can also be made with almonds, although I had a hard time getting them round and would have been better off cutting the tip off of butterscotch or peanut butter morsels and using them. Then pipe on eyes with the chocolate frosting as the last step before sticking the finished groundhogs into the “dirt” of your finished chocolate cupcakes. Groundhog Day Cupcakes! You could also stick Phil (the cookie) into a cup of pudding topped with some crushed Oreos (to make the dirt). You will not want to make these too far in advance though because the cookies (both the Oreos and Phil) will absorb moisture from the pudding and become very soft. To find out how long cookies last, check out cookie page. To find out how long cupcakes last, check out cupcake page.